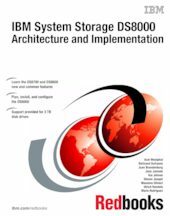 This IBM Redbooks® publication describes the concepts, architecture, and implementation of the IBM System Storage® DS8700 and DS8800 storage systems. The book provides reference information to assist readers who need to plan for, install, and configure the DS8700 and DS8800. The DS8700 includes IBM POWER6-based controllers. The IBM System Storage DS8800 is the most advanced model in the IBM DS8000 lineup and is equipped with IBM POWER6+ based controllers. Both systems feature a dual 2-way or dual 4-way processor complex implementation. They also feature enhanced 8 Gpbs device adapters and host adapters. Their extended connectivity, with up to 128 Fibre Channel/FICON® ports for host connections, makes them suitable for multiple server environments in both open systems and IBM System z® environments. Both systems support thin provisioning and the Full Disk Encryption (FDE) feature. If desired, they can be integrated in an LDAP infrastructure. The DS8800 is equipped with high-density storage enclosures populated with 24 small-form-factor SAS-2 drives. The DS8700 and DS8800 storage subsystems can be equipped with Solid-State Drives (SSDs). The DS8700 and DS8800 can automatically optimize the use of SSD drives through the Easy Tier feature, which is available for no extra fee. For details about Easy Tier, refer to IBM System Storage DS8000: Easy Tier Concepts and Usage, REDP-4667.